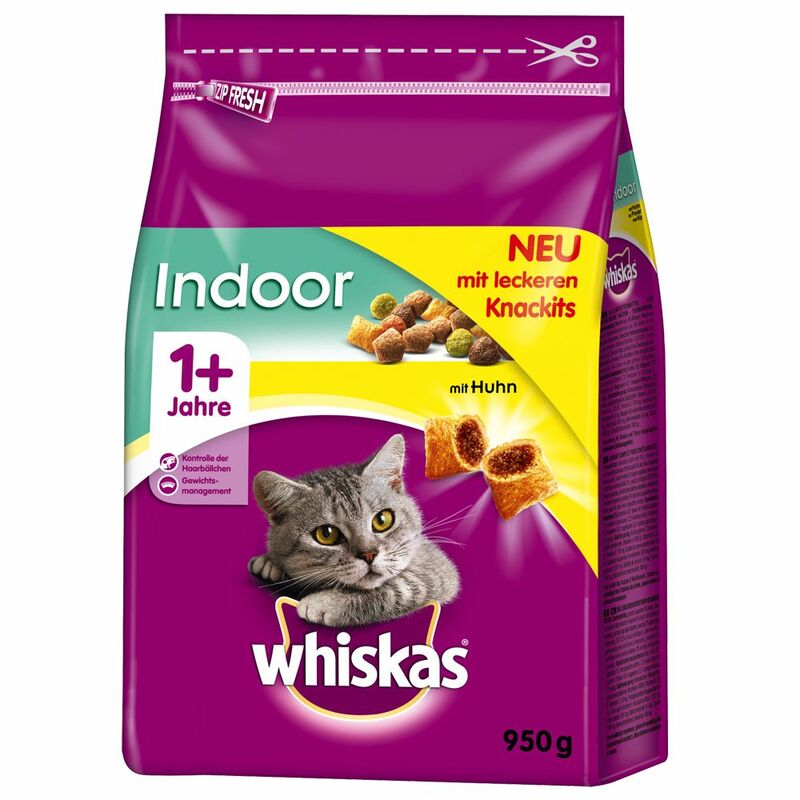 Whiskas 1plus Indoor Chicken is formulated to meet the specific nutritional needs of adult indoor cats. House cats tend to be leΒ active than outdoor cats and spend a lot of time sleeping and eating. The reduced energy content in this tasty, complete kibble helps your cat to maintain a healthy weight, as indoor cats have a tendency to gain weight quickly. Whiskas 1plus Indoor Chicken also helps to reduce the burden on the digestive system and helps to prevent the build-up of hairballs. Your cat is sure to love this great-tasting food! Whiskas 1plus Indoor Chicken at a glance: Complete dry food for adult indoor cats aged over 12 months old Premium quality, healthy ingredients for a balanced nutrition Reduced energy content: formulated to meet the specific nutritional needs of indoor cats Taurine: supports a healthy heart Natural oils: help improve the condition of fur Healthy eyesight: the high content of vitamin A supports your cat's vision Anti-hairball effect: helps to reduce formation of hairballs Balanced mineral content: supports a healthy urinary tract In a practical resealable bag, which ensures that the kibble stays fresher for longer Please be advised: the images of the products on our site are for illustrative purposes only and actual packaging may vary. Price just £2.69! Click here to buy now!